This was our second time kayaking Island Pond in Stoddard, out in the Monadnock Region and we were excited to see and hear our first loon of the season! Our first trip here (exactly one year ago) ended after about 20 minutes on the water because of stormy weather. This time around, we enjoyed a full two hours on the pond, reveling in the many beautiful shades of green and all the birds and turtles. If you haven't visited, you may want to add this place to your list. What I loved best about Island Pond was the great variety of the waterscape and the wildlife. There were several islands, grassy marshes and small coves to explore, as well as some lush hills in the distance. First off, it's a very easy sandy put-in right off Route 123 north. That means you'll hear some road noise while you are out on the water, but it's really not a heavily travelled road and shouldn't impact your peaceful time on the water too much. There's also more development on the pond than we usually like to see -- but again it wasn't anything that detracted from our enjoyment. In my view, there are more plusses than minuses here. Some of the many shades of green on Island Pond. 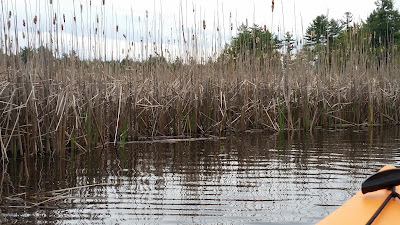 Aside from being treated to the haunting call of the loons, we enjoyed many other smaller birds serenading us while we were on the water. Doug spotted a snapping turtle and we saw a few Eastern Painted turtles sunning themselves. At least, I think that was the species -- don't hold me to it! Two small caveats: Island Pond is a rocky place, with some very shallow areas. So you need to be on the lookout when you are paddling here. Power boats are also allowed and there's a water-skiing channel. We were lucky that we only encountered one power boat that quickly cut it's engine. So that wasn't a factor, but it might be a different story on a busy summer weekend. 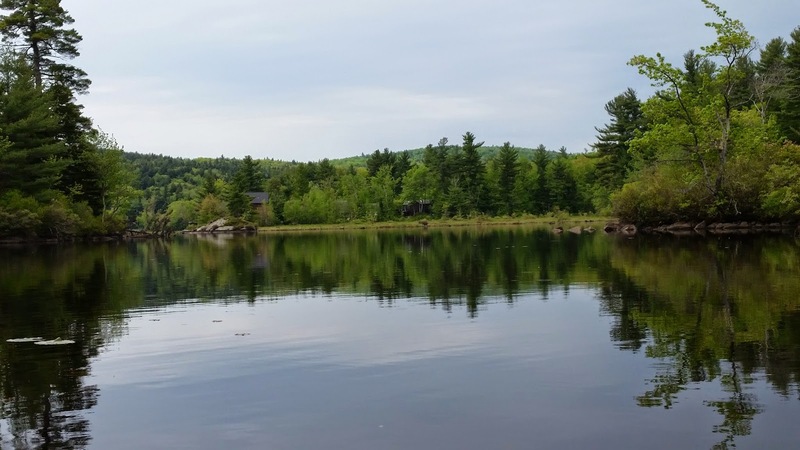 Overall, I loved our time here and think you will probably agree that Island Pond is a very serene spot to spend a few hours enjoying some of the best that southwest New Hampshire has to offer. Get out and enjoy and stop back in to let us know about your experience! Directions: From Rte. 202 in Peterborough, take Rte. 123 North to Hancock. Look for the pond on your right shortly after the intersection of Rtes. 9 and 123. There's plenty of off-road parking and a porta-potty here. 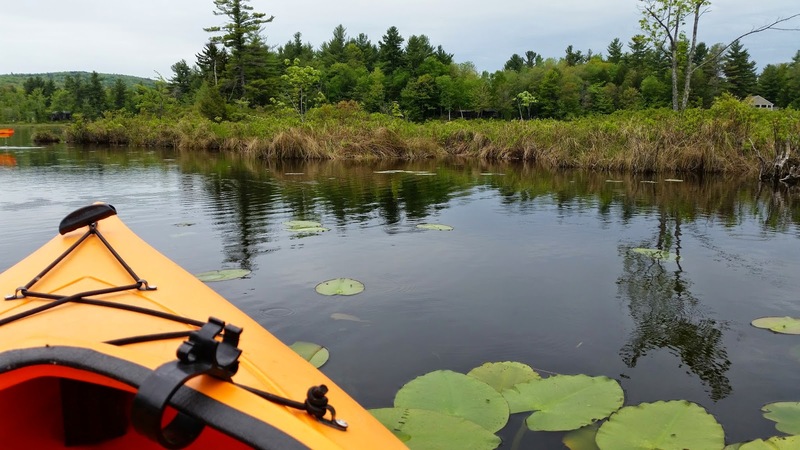 Find great places to kayak quiet water, bike down a shady path, or snowshoe through the woods. 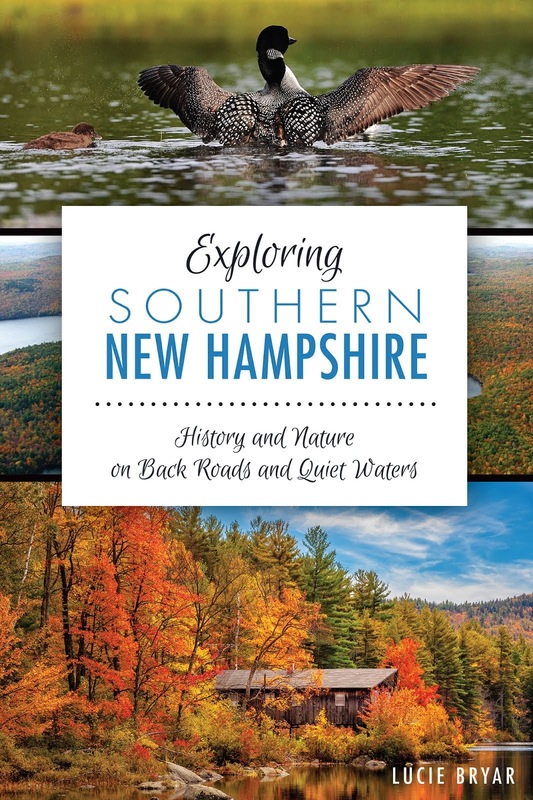 Join us as we explore New Hampshire, slow and easy. Click the cover image to order on Amazon.